Depending on the severity, a pelvic fracture can mean the end of a horse's useful life -- possibly the end of life entirely -- or it can completely heal with treatment and time. If your horse experiences pain in his back end or develops asymmetry in his hips, have your vet examine him immediately. A horse's pelvis consists of bones including the ischium, ilium, acetabulum and pubis. The pelvis connects the animal's spine at his sacrum and forms the sacroiliac joint. The pelvis creates the hip joint where it joins the rear of the femur. Any of these pelvic structures can suffer a fracture. 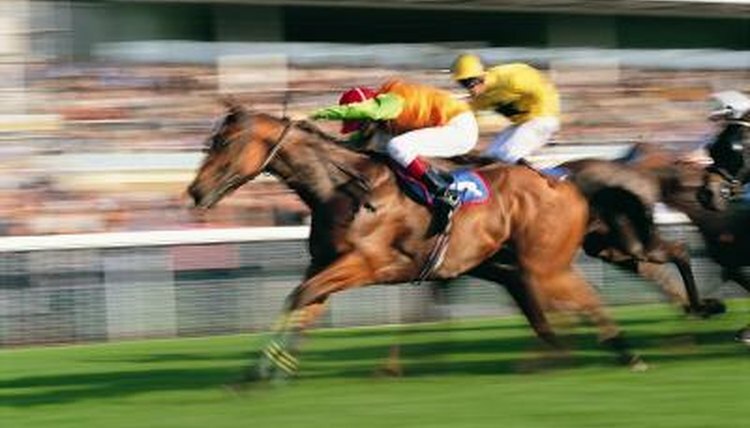 The horse's prognosis depends on the location of the break and the amount of stress it receives. A horse diagnosed with a complete, displaced pelvic fracture generally won't recover. Your vet might advise humane euthanasia. A horse with a fractured pelvis will usually not bear weight on one or both of his hind legs, and will appear in obvious pain. If the injury results during training, you'll notice at once that something is wrong with the horse. Such injuries result because of trauma during pasture turn-out, including kicks from other equines, or because of becoming cast in a stall. The latter means he's gotten stuck while lying down, with his legs in a position against the wall where he can't right himself. Many horses panic and begin thrashing around. While complete pelvic fractures are quite obvious, incomplete pelvic stress fractures are sometimes misdiagnosed as muscle injury. A vet performing only a clinical examination and not using sophisticated diagnostic tools could suspect the less serious lameness results from an injury to the sacroiliac or stifle joints. However, sacroiliac lameness usually comes on gradually, not acutely. While an incomplete stress fracture can resemble these less serious hind end injuries, if the break becomes complete, the horse will go downhill quickly. Since the equine pelvis is difficult to X-ray, your vet will use ultrasound or a bone scan to diagnose a suspected fracture. If your horse is diagnosed with an incomplete fracture, your vet will prescribe long-term stall rest. Such confinement last for three to six months or longer, the vet performing regular ultrasounds to determine the degree of healing. Your vet will discuss your horse's prospects for future soundness. Some horses might completely heal and return to riding and even competing. Stallions and mares might be sound enough for breeding but not for riding. Other horses might be "pasture sound." That means the fracture heals sufficiently so that they are not in pain if turned out in a pasture but not enough for the horse to perform any sort of work.